Or, the Whale is a band out of San Francisco whose staggering vocal harmonies and Neil Young-inspired guitar riffs take you back to a time when music felt real. There’s a craftsmanship to their songs that is tough to explain, but easy to recognize. When they came on the scene six years ago, Or, the Whale had a more traditional Americana sound. 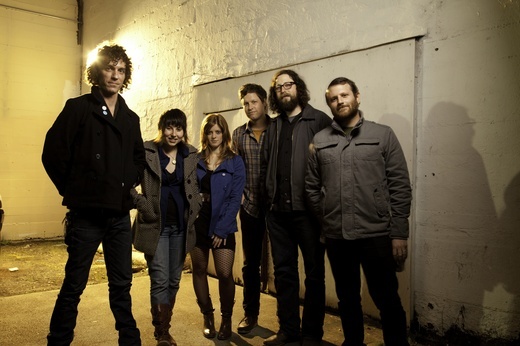 In fact, the band’s 2007 album Light Poles and Pines featured the debut single “Call and Response,” which helped earn the band a 2008 Hollywood Music Award for Best Americana/Roots Artist, as well as a coveted spot on Radio & Records Top 100 Americana Artists of 2008. After Light Poles and Pines, many of Or, the Whale’s songs took on a darker, more electric sound. This is evidenced in tracks from the band’s self-titled sophomore album released by Seany Records in 2009. Such songs include “Black Rabbit,” which features a gale-force chorus above electric feedback and pounding drums and the creeping “Keep Me Up,” which shows how Led Zeppelin’s “No Quarter” might sound if re-imagined through the mournful wail of pedal steel. Still, Americana is never far from their hearts, which is positively proven with “Never Coming Out”—a paranoid and agoraphobic rail ride that explodes into a final a capella starburst. Or, the Whale continues testing the boundaries of its own sound, always managing to keep one foot in the shadows and the other in the light. Perhaps this is due to the changing lives, tastes, and skills of its veteran members: Alex Robins (vocals, guitar), Lindsay Garfield (vocals, percussion), Jesse Hunt (drums), and Tim Marcus (pedal steel). Or, maybe it’s the result of an addition of two major talents: Lia Rose (vocals, keyboards, guitar) and Sean Barnett (vocals, bass). Either way, using history as a guide, you can be sure the songs of Or, the Whale will be tangible and real.